Wow … I haven’t posted on here since AUGUST! That is not good. 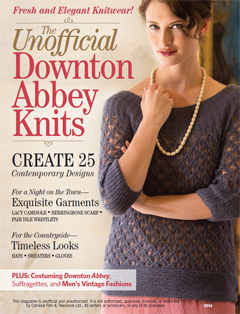 The issue of The Unofficial Downton Abbey Knits 2014 is just hitting the newstands. I have a design in there: Luxurious Lacy Blouse done in Zealana’s Luxuria Air. But the really cool news … the “big deal” as it says in the title of this post? my design is on the cover! The Zealana Luxuria Air is a blend of cashmere, silk and possum down and it is so very soft and drapey — it’s like knitting with air. My design is a very elegant top which can be pulled down over the hips or bloused-up when the band sits at the waist. It’s done completely in the round (so no seaming) and has a nice, wide ribbed collar to cling to the shoulders. What do you think? Isn’t it a fun knit? If I was a knitter I would go right out and buy this book. I love that sweater—it belongs on the cover! It’s beautiful, Mary – congratulations! That’s really exciting! Wow! That is awesome! Well done.